If you are new to web services then please first see the definition with an example. You can download the HP Service Test 11 trial here. 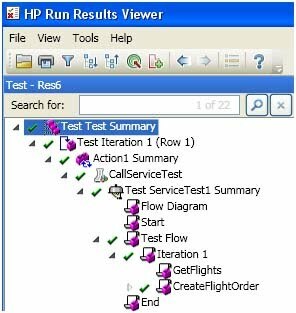 Start > (All) Programs > HP Service Test 11 > Sample Application. Closing this window will stop the HP Flights service. Create a new solution. Go File (Menu) -> New -> Test (CTRL+SHIFT+N) and type the name as "sample test service" and click create. You will see a canvas with Start-End Flowchart. On left hand side you will see a Toolbox. Expand Web Services (it shows only a SOAP Request). First import a web service. a. On the toolbar, below Menu, from Import Service select Import Service from URL/UDDI, a "Import Service from URL/UDDI" dialog box opens. Enter "http://localhost:24240/HPFlights_SOAP?wsdl" address in the Address textbox and click ok.
b. 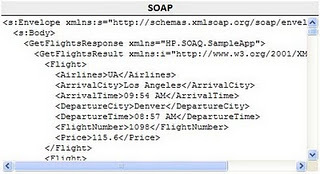 Once the service is imported, in the Toolbox you will see HPFlights_Service under Web Services. Drag GetFlights method to Test Flow. On right hand side (from Property Sheet), expand Input -> GetFlights node and for DepartureCity type Denver and for ArrivalCity type Los Angeles. Now drag CreateFlightOrder method on Test Flow, just below the GetFlights. 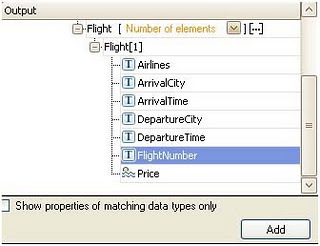 On right hand side (from Property Sheet), expand Input -> CreateFlightOrder -> FlightOrder node and for Class type Business, for CustomerName type Sachin, for DepartureDate choose some future date, for NumberOfTickets type 2.
a. 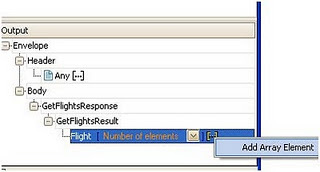 On the right hand side of FlightNumber text field, click on Link to a data source icon. b. 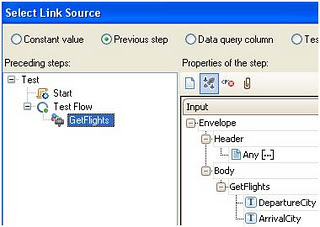 Select Link Source dialog opens. c. Choose Previous step radio button. e. In the Output section, right-click the Flight[…] node and choose Add Array Element from the menu. 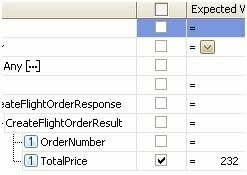 f. Expand the Flight array, select the FlightNumber element and click Add. g. Click ok to come out of Link Source dialog. 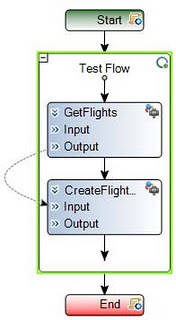 Now your canvas indicates that output of GetFlights method goes as input to CreateFlightOrder method. Click inside the Test Flow pane (clicking brings green border to it), in the property sheet on the right hand side, select For Loop and enter 1 in the Number of Iterations. Save the test and run it. In the test results window that opens up, on the LHS just expand all nodes and click on the CreateFlightOrder node and on the RHS in the HTTP Response snapshot check the total price (as you see in the above screenshot as 232). 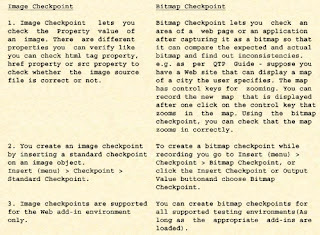 Now for setting a Checkpoint, go to the Service Test canvas where your test is open, On the RHS in the Property Sheet under Checkpoints, type in the value of 232 in Expected Value for TotalPrice and check the checkbox. Now in the Test Results you will see a green tick also. Let’s try to run the test we created here via QTP 11.0 (NOT Service Test 11.0) and see how you can test your GUI and UI-Less Application Functionality in One Test. Open new test in QTP. Go to Insert (Menu) -> Call to Service Test Test…. Call to Service Test Test window opens. 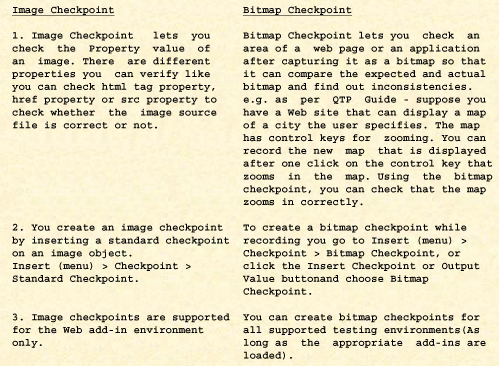 Navigate to the test (which was created in Service Test 11.0 and saved on the disk). Click OK to come out of Call to Service Test Test window. This is just a simple example. 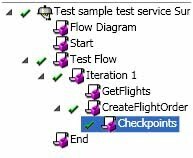 You can add other code before or after this call to service test in order to see the testing of GUI and Non-GUI part in one test. It will run the test and show the combined results in the Run Results Viewer.